OVER THE YEARS dozens of friends supported Billy Graham, protected him, helped him think strategically, and carried responsibilities so that he could focus on public ministry. Decision magazine editor Sherwood Eliot Wirt compiled a list of 30 of Graham’s “royal musketeers.” Here are five key friends from among them who joined Graham in his earliest days and stayed with him. Five years younger than Graham, Cliff Barrows first sang at a Billy Graham campaign in 1945 in Asheville, North Carolina. Barrows and his wife, Billie, interrupted their honeymoon to fill in when Graham’s regular song leader left abruptly, and a six-decade alliance was born. Barrows joined Graham full time in the late 1940s. In 1950 Barrows became part of the founding board of the Billy Graham Evangelistic Association (BGEA) and took the reins of the Hour of Decision radio program. As years passed Barrows acquired other roles, including president of World Wide Pictures. Most observers considered Barrows the number-two man in the BGEA. Behind the scenes he defused budding controversies and kept the organization humming. As the song leader at Billy Graham crusades, the genial and charismatic Barrows welcomed the crowds that flocked to hear Graham preach. Educated in music and Shakespearean drama at Bob Jones College, Barrows deftly kept services moving and ably led thousands in congregational singing. As the last opening act for each Graham service finished, Barrows would excitedly give the floor to “a man with a message for these crisis days.” Billy Graham. Barrows’s showmanship was integral to the success of Graham’s crusades, for both attendees and the millions who watched on television. When intense heat prematurely ended Graham’s 1962 Soldier Field service in Chicago, Barrows devised a plan to fill the seven minutes still needed for an hour-long television broadcast. He took Graham back to the stadium hours after the last visitor had left. Alone in the stadium, Graham filmed a plea for viewers not to miss their chance to give their lives to Jesus. The panorama of a deserted and desolate Soldier Field provided a dramatic backdrop for Graham’s message. Viewers made the largest-ever response to a Graham television program. In the last third of his career, Barrows was inducted into the Gospel Music Hall of Fame, the Religious Broadcasting Hall of Fame, and the Southern Baptist Evangelists’ Hall of Faith. He increasingly accommodated new singers onto crusade platforms in the 1970s and 1980s, as contemporary Christian music became part of the services. But Barrows kept a firm hand on crusade programs, and his unerring leadership of classic hymns gave services predictable appeal for decades. In 1934 Billy Graham and his friend Grady Wilson attended a revival meeting together in Charlotte, North Carolina. The two 15-year-olds joined the choir—which sat behind the pulpit—to escape the withering gaze and damnation preaching of visiting revivalist Mordecai Ham. Their plan didn’t work. During the invitation hymn, Graham and Wilson felt convicted of their sin, went forward, and registered a decision for Christ. They invited countless others to follow in their steps over the next 50 years. Wilson was the first of the two to announce his intention to go into full-time ministry. He began preaching around age 18 and was ordained a Baptist minister at 19. Graham soon decided to enter the ministry as well. They enrolled together at Bob Jones College, but the school’s strictness drove Graham away after just one semester. The two reunited briefly at Wheaton College in 1943 and then permanently in 1947, when Wilson joined Graham’s team as an associate evangelist. Wilson accompanied Graham on some of his earliest ventures into the national limelight, including a 1950 White House visit with President Harry Truman and a 1952 Christmas campaign with soldiers in Korea. Wilson won acclaim as a preacher in his own right, attracting the attention of prominent Christian businessmen like R. G. LeTourneau and H. L. Hunt. During a 1963 visit to the White House, Wilson’s storytelling tickled Lyndon Johnson enough that the president asked an aide to take notes. Like his younger brother Grady, Thomas Walter (T. W.) Wilson attended the 1934 Mordecai Ham revival and soon after heard a call to ministry. He pastored several churches in Georgia and Alabama in the 1940s before reluctantly accepting Graham’s invitation to serve as vice president of Northwestern Schools in Minneapolis in 1948. Like Graham, Wilson made a poor college administrator, and he left the school in 1951 to launch an independent evangelistic ministry. Bev Shea was the oldest of Graham’s inner circle and the first to establish his own fame. An Ontario native, Shea moved south to Chicago in the 1930s to work for WMBI, the radio station owned by Moody Bible Institute. Graham first heard Shea sing on the radio after enrolling at Wheaton College in 1940. After Graham became pastor at Western Springs Baptist Church, he took over the radio program Songs in the Night. Graham persuaded Shea to join the Songs in the Night broadcast team. From that point forward, Shea’s rich bass almost always served as the prelude for Graham’s staccato preaching. Because of his radio fame, Bev Shea’s name headlined the handbills for some early Graham campaigns. (“Bev Shea will sing. 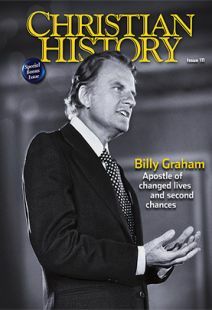 Billy Graham will preach.”) He sang hymns unadorned, and listeners reveled as his voice blended reverence with warmth. At the 1957 crusade in New York City, Shea became forever linked with the hymn “How Great Thou Art,” which he sang on 108 consecutive evenings—by popular demand. His own composition, “I’d Rather Have Jesus,” was another perennial favorite. Shea recorded more than 70 albums, won a Grammy in 1966, and in 2011 received a Lifetime Achievement Award from the Recording Academy, the organization that sponsors the Grammies. He sang live to over 200 million people, the vast majority at Billy Graham crusades. For most of their adult lives, Shea and Graham lived just one mile apart in Montreat, North Carolina. Shea died at the age of 104 in April 2013. George Wilson—no relation to brothers Grady and T. W.—ran the Billy Graham Evangelistic Association from its inception in 1950 until his semiretirement in 1987. Wilson developed a reputation for hard-nosed efficiency and a brusque manner. One associate said Wilson had “a unique gift for giving directions.” Among the genial and conciliatory personalities that dominated BGEA’s inner circle, George Wilson’s firm demeanor stood out. A Minneapolis-based layman, Wilson met Graham at a 1945 Youth for Christ rally in Chicago. Two years later, Graham assumed the presidency of Northwestern Schools, where Wilson served as business manager. He filled the same role when the BGEA formed in 1950. More than any other person, Wilson was responsible for the organization’s legendary efficiency and modest trappings. He told biographer William Martin about acquiring the BGEA headquarters for $2.25 per square foot—“easy to believe” about the dreary building, wrote Martin—and he boasted about efficiencies that saved as little as half a penny for each letter the BGEA received. For an organization that received millions of letters each year, those savings added up. Seth Dowland teaches American religious history at Pacific Lutheran University and is the author of Family Values: Gender, Authority, and the Rise of the Christian Right.